The Oslo Agreement, also knows as the Oslo Accords, is an agreement signed between the State of Israel and the Palestine Liberation Organization (PLO) on September 13, 1993, meant to effectively bring the Israeli-Palestinian conflict to its end by means of territorial concessions and facilitating the creation of the Palestinian Authority. The accords, representing a milestone in Israeli-Palestinian relations, were finalized in Oslo, Norway, on August 20, 1993. The official signing ceremony was held in Washington the following September, with then-Israeli Prime Minister Yitzhak Rabin and PLO Chairman Yasser Arafat representing both sides and US President Bill Clinton serving as their witness. September of 1993 saw a major breakthrough in the clandestine negotiations between Israel and the PLO, as Arafat relayed a message to Rabin saying his organization was willing to acknowledge Israel's right to exist and adhere to UN resolutions 242 and 338. Arafat's message also stated that the PLO was willing to commit to finding a peaceful solution to the Israeli-Palestinian conflict, to relinquish all forms of terror and to revoke the clauses in the Palestinian National Covenant which negate Israel's right to exists. Following these decisions, Israel agreed to recognize the PLO as the Palestinian people's official representative for any peace talks. Israel's willingness to see the PLO as a legitimate peace partner was considered a dramatic change in policy, since up until then it was considered a terror organization and any and all contact with it was prohibited by law. The accords were divided into two: The first chapter, dubbed Oslo-A, detailed a declaration of principles on Interim Palestinian self-government; while the second chapter – Oslo-B – was finalized in 1995 and included an expansion of the Palestinian Authority's territories, mutual security engagements and the regulation of Israeli-Palestinian relations. The Israeli government voted in favor of the agreement 61 to 50. Oslo-A stated that Israel would withdraw from parts of the Gaza Strip and West Bank in favor of autonomous Palestinian rule. The agreement also called for democratic elections to be held for the Palestinian Legislative Council; and had both sides agree to a five-year interim period meant to give the Palestinians time to establish their government; postponing negotiations on the core issues of a permanent agreement, the likes of the status of Jerusalem and the question of refugees, to year three of the interim rule. It was also agreed that once a permanent agreement is struck, it would be implemented within five years. Area A – which would be under the Palestinian Authority's full control and include all Palestinian cities and surrounding areas with no civilian Israeli presence. Area B – which would be under the Palestinian Authority's civil control and Israel's security control and Include areas of dense Palestinian population with no civilian Israeli presence. Area C – which would be under full Israeli control, except over Palestinian civilians. This area includes all West Bank settlements and their immediate vicinity as well as strategic areas dubbed "security zones." On May 4, 1994, the first phase of the Oslo Accords was implemented, as Israel and the PA signed the Cairo Agreement, giving the Palestinians control over Gaza and Jericho. The agreement was widely considered a test case to the PLO's ability and willingness to relinquish and fight terror, as wall as to its ability to rule over civilian population. As part of the agreement, Israel also released 5,000 Palestinian prisoners. Oslo-B, was finalized in September of 1995 in Taba, Egypt. According to the agreement, the PA was to receive additional territories, Israel withdrew from densely populated areas in the West Bank, mutual security engagements were agreed upon arnd the PLO pledged to have Palestinian National Covenant clauses which deny Israel's right to exist annulled. In January of 1997, Israel and the Palestinian Authority reached an agreement specifically pertaining to the West Bank city of Hebron, which was considered an exception to the Oslo rule due to the large Jewish community living in it. According to the Hebron Redeployment Protocol, the city's security would be divided into two, with Israel controlling the Jewish part of the city and the PA it's Palestinian part. Both sides also agreed to have an international monitoring force oversee the proper implementation of the agreement. July of 2000 would see Israel and the Palestinian Authority attempt to negotiate the permanent agreement at Camp David, Maryland. The move essentially failed and the al-Aqsa Intifada soon ensued. 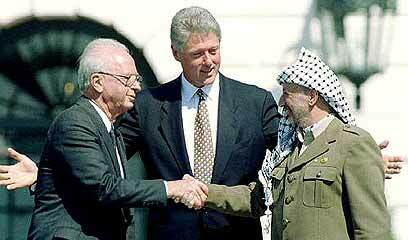 The Oslo Accords are considered to have had a significant effect on the geopolitical landscape of the Middle East. Their nature remains controversial.